Marine technicians Nick Matthews (wearing orange hat) and Elizabeth Ricci (in blue hat) teamed up with Ronnie De Leon, the bosun on the research vessel Atlantic Explorer, to recover the BIOS glider Minnie offshore Bermuda. Photo by Jorge Sanchez. Each spring, when daffodils and other flowers emerge in gardens, tiny ocean plants called phytoplankton also undergo a surge of production and rapid growth near the surface of the Sargasso Sea. Although each marine phytoplankton is small—tinier than the period at the end of this sentence—it carries tremendous responsibilities. Using energy from sunlight, phytoplankton draw in nutrients, carbon dioxide, and water from their surroundings to reproduce. In the process they emit life-giving oxygen and provide food for a host of larger marine organisms, from snails to whales. Thus, they represent the core of the entire marine food web. For BIOS physical oceanographer Ruth Curry, this spring event is a chance to send a trio of robotic underwater gliders out to observe the details of the seasonal transition in this part of the world, from late winter to early summer. Her goal is to form a clearer scientific picture of how wind, eddies, currents, and a host of other physical factors influence the bloom happening beneath the ocean’s surface. From now until June, Curry is monitoring the gliders from shore as they crisscross waters offshore Bermuda. Their journey began January 6, when one of the gliders, named Jack, was dropped from the BIOS research vessel Atlantic Explorer into wind-swept waters 30 miles (48 kilometers) southeast of Bermuda. A month later two more BIOS gliders, named Anna and Minnie, were deployed at nearby sites, spaced about 40 miles (64 kilometers) apart. The gliders work as a team. Minnie and Anna patrol two areas—Hydrostation ‘S’ and the Bermuda Atlantic Time-series Study (BATS) sites—which have been monitored by ship visits from BIOS on a monthly schedule over many decades. Meanwhile, Jack runs continually back and forth between them, acquiring a cross section of the ocean every five days. Curry controls the gliders from her laptop as they execute their missions, profiling the water column daily down to 3,000 feet (914 meters). When they surface every six to seven hours and send data to shore by satellite, she watches the undersea story unfold. Each six-foot (1.8-meter) long vehicle is equipped with sensors that collect measurements of temperature, salinity, nutrients, currents, as well as oxygen and chlorophyll (a pigment in phytoplankton used to measure their abundance). Though operating cohesively, each glider has specialized capabilities. 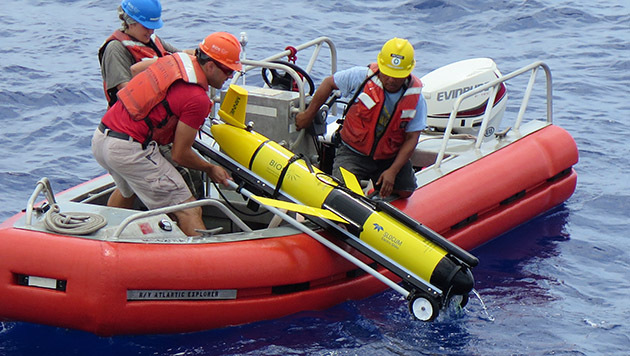 Jack is outfitted with an instrument known as an Acoustic Doppler Current Profiler, or ADCP, which provides measurements of ocean current strength and structure. Minnie is equipped with a state-of-the-art nitrate sensor to measure nutrients. Together, these measurements enable researchers to address long-standing questions about biological productivity that supports the marine food web, as well as the ocean’s role in drawing down carbon dioxide from the atmosphere, which affects the rate of climate warming. How winter storms and gales influence phytoplankton production at this time of year is also of particular interest to Curry. Strong winds appear to create turbulence and mixing below the ocean surface, bringing nutrients from depths below 500 feet (150 meters) up into the sunlit layers, where phytoplankton need them to reproduce. Seeing the data collected by the gliders in real time allows Curry to immediately begin interpreting the action offshore. For example, in early March, a series of cold, stormy gales set the upper ocean into a mixing frenzy, the effects of which extended downward to below 900 feet (270 meters) and caused the amount of phytoplankton to more than double in less than a week. This bloom will continue through the next few months until summer, but the intensity may vary from week to week, contributing to large differences in productivity that have been observed from year to year. The causes of these variations are among the focuses of Curry’s investigation. The framework for understanding these processes was built from analyses of long-running time series measurements at the Hydrostation ‘S’ and BATS sites. For decades these locations offshore Bermuda have been regularly visited using ship-based technologies to compile monthly snapshots of physical, biological, and chemical properties that underpin the cycling of carbon, oxygen, and nutrients in the Sargasso Sea. 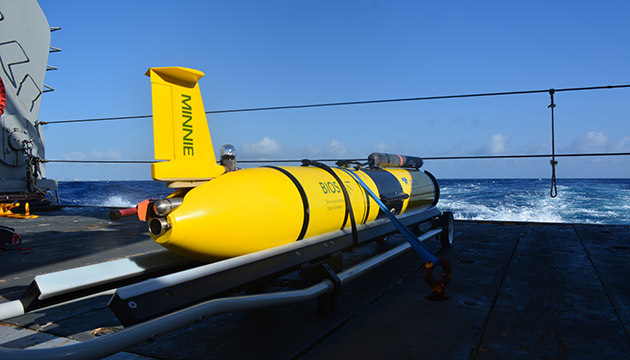 The glider Minnie is one of three autonomous underwater vehicles (AUVs) maintained by BIOS. Though operating cohesively, each glider has specialized capabilities. Minnie is equipped with a state-of-the-art nitrate sensor to measure nutrients. Photo by Jorge Sanchez. But this monthly sampling has not provided the intricate level of detail needed to fully understand these processes. “The gliders’ ability to sample continuously hour-by-hour over periods of months is providing information needed to understand what happens on those shorter time scales and filling critical gaps in the current picture,” Curry said. Hints of these details emerged in late 2015 and early 2016 during a five-month glider mission conducted at the BATS site. Based on the data collected, Curry designed her current experiment to test some ideas about the relationship between winds, currents, turbulent mixing and phytoplankton production, resulting in this spring’s mission. When the gliders are recovered in June, their full data sets will be analyzed to either support or disprove Curry’s ideas. Moving forward, she will ultimately seek to compare data gathered offshore of Bermuda to other data sets, such as the Hawaii Ocean Time Series, and assess whether similar (or different) dynamics are at work in a variety of locations around the globe.